Milo and Lina Graf have picked up the trail of their kidnapped parents - but an ambush in the depths of Wild Space leaves them stranded on a desolate ice planet. With an old enemy out for revenge, can they survive The Cold? 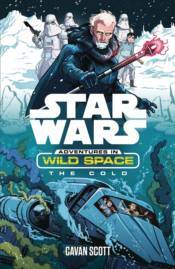 The Adventures in Cold Space chapter books are set before the events of Rebels and Rogue One and features a young brother and sister (Milo and Lina) and their droid CR-8R on their journey to save their parents from the cruel captain Korda and the Empire.